Due to the vertical nature of medical cylinders (i.e. lengthwise with valve on top), many patients prefer to carry the cylinder in the vertical position under their shoulder, allowing the cylinder to hang vertically down the length of their body. The vertical shoulder bag allows the patient to carry the bag in this position while concealing the entire oxygen system. The cannula exits the bag through a small grommet, travels under the patient's arm, and rests comfortably over the patient's ears. The bag employs an adjustable, heavily padded shoulder strap to reduce stress from the weight of the cylinder. A clear plastic zippered window allows the patient to view the gauge contents of the cylinder without removing the cylinder form the bag. 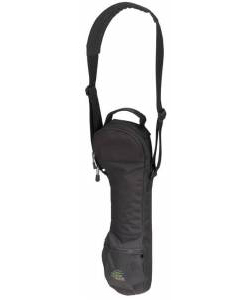 The bag is constructed of washable, heavy-duty denier, has large easy-grab zipper pulls, an embroidered carrying handle for easy pick up, and a large external zippered pocket. This bag is designed for MD medical cylinders.